70% voter turnout was recorded in Karnataka where polling for the high-stakes 225-member state assembly was held under a thick security blanket and the watchful eyes of the Election Commission since morning on Saturday. BENGALURU: 70% voter turnout was recorded in Karnataka where polling for the high-stakes 225-member state assembly was held under a thick security blanket and the watchful eyes of the Election Commission since morning on Saturday. The voting was held in 222 out of the 224 seats. The Election Commission had deferred the polls for the Rajarajeswari Nagar constituency to May 28 after a massive row erupted over a large number of voter ID cards being found in an apartment. Most of the exit polls today predicted a hung assembly in Karnataka with no major political party winning a clear majority. Most of the pre-polls had earlier predicted a tight race between the two main political parties, BJP and the ruling Congress, which left no stone unturned in wooing the voters here. The state of Karnataka had witnessed a three-cornered contest between the ruling Congress, the BJP and former prime minister HD Deve Gowda's JD(S) - which is predicted to play a kingmaker's role in the government formation in the state. Karnataka has over 5.06 crore electorate, including 2.6 crore men and 2.5 crore women. A total of 15.42 lakh voters, aged 18-19, had registered for the first time. Polling was held in 58,008 stations in 30 districts, with 600 of them dubbed 'pink booths', overseen by women personnel. Over 1.5 lakh security personnel were deployed. The vote count will take place on May 15. Zee News Maha Exit poll predicted a fractured mandate and a hung assembly likely in Karnataka. Voting ends in Karnataka; 70% voter turnout recorded in Karnataka, reports PTI. Low voter turnout in Badami from where Karnataka CM Siddaramaiah is contesting against BJP's Sriramulu, say reports. Re-polling ordered in Hebbal assembly constituency's Polling Station Number 2 after voting was stopped due to EVM failure, reports ANI. 61.25% voter turnout recorded till 5 pm, reports ANI. Rain lashes parts of Hubli, voting affected; voters forced to take shelter at Polling Station 185, reports ANI. Majority of the 3500 residents of Chittapur taluk's Tarkaspet village in Kalburagi district are boycotting polls over their demand for Gram Panchayat headquarters for their village, reports ANI. Several restaurants in Bengaluru are giving discounts ranging from 5% to 20% to customers who show inked fingers as a proof that they have exercised not just their democratic right but their duty as citizens of the country, say reports. Voter turn-out affected due to 43-degree Celsius temperature in the Kalaburgi, say reports. There was a rush at the booths in the morning, but now there is hardly any crowd at the booths as the temperature is quite high. Right now, it is more than 40 degrees,' claims a voter. 56% voter turnout recorded till 3 pm in Karnataka, reports ANI. About 11% polling was recorded in the first two hours of voting in Karnataka. Dakshina Karnataka district recorded the highest voter turnout with 16% votes registered until 9:30 AM, followed by Udupi district which recorded 15% turnout. Election authorities said "moderate to brisk" voting has been witnessed in 222 out of 224 seats where polling began at 7 am. People were seen standing in queues to cast their votes in the early hours itself. Senior citizens were seen in good numbers standing in queues at various polling stations to cast their votes early. After an initial glitch due to malfunctioning of EVM at a booth in Hassan, HD Deve Gowda, his wife Chennamma Deve Gowda, son HD Revanna and other family members cast their votes at polling booth no 244 in Holenarasipura town in Hassan district. BJP's B Sriramalu performed 'gau pooja' in Bellary before casting his vote. He is contesting against CM Siddaramaiah from Badami constituency. JDS's HD Kumaraswamy meets Nirmalanandanatha Mahaswami of Sri Adichunchanagiri Mahasamsthana Math in Jayanagar. Like Siddaramaiah, the former Karnataka chief minister is contesting from two constituencies - Ramanagara and Channapatna. In Ramanagaram, which is a predominant JD(S) seat, Kumaraswamy won in both the 2008 and 2013 elections. The JD-S is looking to establish itself once again in Karnataka politics and is expected to give a tough fight to both the BJP and the Congress party. Siddaramaiah thanked people for standing in queues to vote in the elections. "Today People of Karnataka are standing in queues to create history & show the nation the way to liberal, progressive, peaceful & compassionate politics & governance. I thank them for their support & wish them well," Siddaramaiah tweeted. There are some reports of faulty EVMs at a polling booth in Hassan. As per reports, HD Deve Gowda's family has been unable to cast their votes due to the same reason. Voting halted at booth number 108 in Hubli due to a faulty Voter Verifiable Paper Audit Trail (VVPAT) machine. While the machine is being replaced, voting has been stopped at the booth. The polling, which began at 58,546 polling stations, is equipped with Electronic Voting Machines (EVMs) and VVPATs. CM Siddaramaiah also urged people to vote and reached out to the youth specially for their votes. "Our Karnataka is ready for the elections, in which case all the people of the state, especially the young people, will vote and democratically ask for the support. For the last five years to continue development and continuous improvement in Karnataka, please vote for yourself," he tweeted on Saturday. Urging people of Karnataka to vote in huge numbers, Prime Minister Narendra Modi on Saturday tweeted: "Urging my sisters and brothers of Karnataka to vote in large numbers today. I would particularly like to call upon young voters to vote and enrich this festival of democracy with their participation." 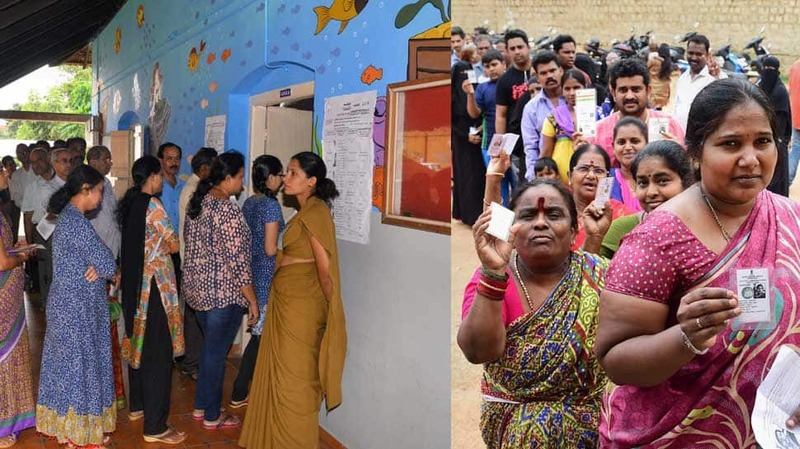 In a first in Karnataka, one all women-managed polling station (Sakhi) has been set up in all rural assembly constituencies and five in each urban constituency (totalling 600 polling stations). Special polling stations have also been given an ethnic look in primitive tribal areas on a pilot basis. People are lining up in Badami constituency where CM Siddaramaiah is contesting against BJP's B Sriramulu. The Congress had on Friday approached the Election Commission urging them to act against B Sriramalu and bar him from fighting the Karnataka elections. Citing a video, the Congress in its letter to the EC had said: "The evidence gives rise to serious questions and allegations about certain heinous and deplorable criminal activities being indulged in by the BJP's candidate Shri. B. Sriramulu." Sriramulu is BJP's candidate for Molakalmunt as well as Badami Assembly Constituencies in Karnataka. The current polls are being viewed as one of the most complex elections in the state. While the ruling Congress and the BJP are the main contenders for power, former prime minister HD Deve Gowda's JDS is likely to play the kingmaker, according to most surveys and opinion polls. Police have made elaborate security arrangements for the smooth conduct of polls that will go on till 6 pm. Nearly 7,500 personnel from like Andhra Pradesh, Telangana, Maharashtram Chattisgarh, Kerala and Goa have also been deployed for security. A day before polls, the EC had said that voting in Rajarajeshwari Nagar constituency has been deferred after a huge number of voter ID cards were recovered from an apartment in Bengaluru. The voting in Rajarajeshwari Nagar will now be held on May 28 and the counting will be done on May 31. Union Minister and BJP leader Sadananda Gowda also voted in Puttur. Confident that there will be an increase in the voting percentage, he said: "Certainly there will be increase in voting this time. They want to remove the Siddaramaiah government from Karnataka. People will come out in large numbers." BJP's chief ministerial candidate BS Yeddyurappa were among the early voters on Saturday morning. Yeddyurappa voted in Shikarpur in Shimoga. Just before casting his vote, he said that people are fed up with the Siddaramaiah government. "I urge the people to come out and vote for BJP. I assure the people of Karnataka that I'm going to give good governance," Yeddyurappa said. Voting has begun for the high-stakes Karnataka assembly elections under a thick security blanket.